George Traffin, a long-time smoker of 55 years, kicked the smoking habit. Tobacco users can often pinpoint one experience that led them to their decision to use tobacco. 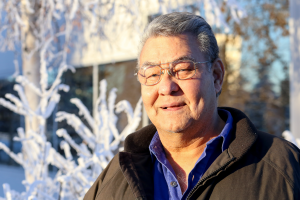 For 76 year-old George Traffin, that experience was one that influenced not only him, but contributed to the Alaska Native Health Campus becoming tobacco-free. Originally from Chignik, Alaska, Traffin was raised in Valdez. He played basketball competitively until he found himself so ill that he had to travel to Anchorage to receive care at Alaska Native Services Hospital (the previous Indian Health Service located in downtown Anchorage). It was there Traffin learned his illness would leave him hospitalized for months. After receiving the news of his health, the devastated teenager hardly wanted to leave his hospital bed. A week later, he realized the doctors were confident he would beat the illness. Traffin began feeling healthy again soon after receiving treatment, but he would still be hospital bound for months. During this time, Traffin, surrounded by smokers who were allowed to smoke at the hospital, began smoking heavily. By the time he left the hospital a year later, Traffin considered himself a smoker, and did so for 55 years. For health reasons, Traffin decided to quit tobacco for life. He tried twice to quit tobacco and was temporarily successful, but wanted to permanently quit. For his third attempt, he decided to contact the Southcentral Foundation’s (SCF) Quit Tobacco program. As he waited for a return call from the program, he sat in his truck desperately craving a cigarette. Just when he was about to light up, his phone rang; it was a tobacco treatment specialist asking him to come in for an appointment. Traffin called this “an act of God” and the moment his life changed. Traffin took ownership of his decision to quit. He worked with the tobacco treatment specialist to create a quit plan that did not depend on the use of nicotine replacement therapy, but rather focused on relationships and behavior modification through positive thinking. He has been tobacco-free for over two years now. Traffin is aware of the Alaska Native Health Campus’ tobacco-free policy and believes the implementation is great. He shared that if it hadn’t been so easy to access tobacco and places to smoke, he may not have taken up the habit as a young teenager. SCF’s Quit Tobacco program is unique, as quit plans are customized to each customer-owner. Dependent on desires, past experiences, or beliefs, customers have the opportunity to share what they want their tobacco-free journey to look like. In Traffin’s case, his “cold turkey” method worked for him with follow-up and encouragement from his tobacco treatment specialist. program has helped almost 13,000 customer-owners become tobacco-free. If you or someone you know is interested in quitting, call SCF’s Quit Tobacco Program at (907) 729-2689 in Anchorage or (907) 631-7630 in Wasilla.